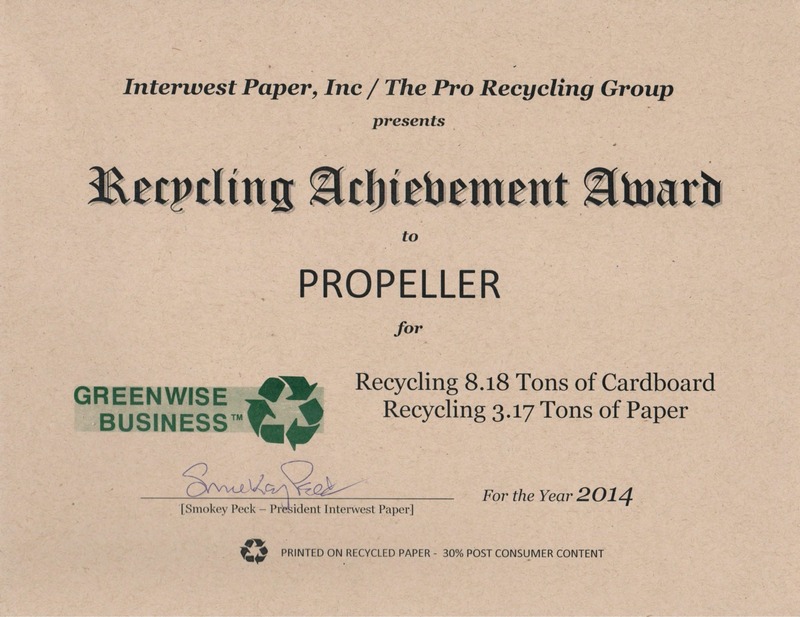 Recycling Award - Third-Party Logistics - Propeller Inc. Recently we recycled over 25.93 tons of Corrugate and 9.5 tons of plastic over the years. Propeller is the the your green partner in fulfillment! By reducing waste and consumption we are able to keep costs down and pass the savings on to our customers! With Propeller you have the ability to use salvage boxes for shipping, Source boxes from ecologically sound suppliers and add recycling as an integral part of your supply train. When Propeller recycles corrugate & plastic during the fulfillment process our customers can now claim that they recycle during fulfillment. Recycling just make sense, it saves Propeller in waste management costs and reduces our total waste bin space needed. https://propellerinc.com/wp-content/uploads/2015/05/award.jpg 2545 3300 Aaron Smith https://propellerinc.com/wp-content/uploads/2015/04/logo-300x138.png Aaron Smith2015-05-04 22:09:452015-11-20 18:48:28Recycling Achievement Award!